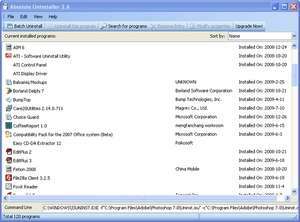 A popular Windows Add/Remove program that offers powerful features. Unfortunately, the built-in Windows Add/Remove programs feature (via the Control Panel) doesn't always fully remove problems thus leaving many broken links such as redundant registry keys and files... leading to slower Windows performance. With Absolute Uninstaller, said junk files and keys can be removed within minutes leading to a faster, higher performance PC experience. Version 5.3.1.21 is a freeware program which does not have restrictions and it's free so it doesn't cost anything. For security reasons, you should also check out the Absolute Uninstaller download at LO4D.com which includes virus and malware tests. Additional screenshots of this application download may be available, too. 4.67 out of 5 based on 12 ratings. Absolute Uninstaller has a presence on social networks.